Chef Joel Antunes will soon take the reins as Executive Chef at Little Rock’s Capital Hotel. Note: See previous related post. 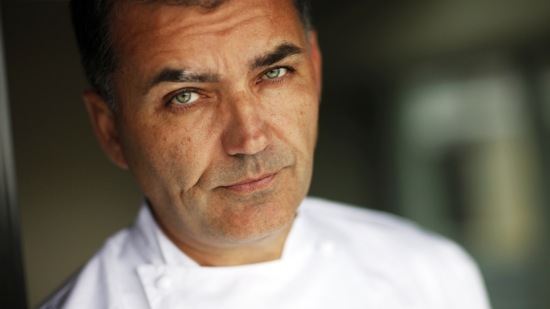 It’s now official: The Capital Hotel has identified its new executive chef, Joël Antunes. Most recently, after The Oak Room, Antunes crossed the pond and headed London’s Brasserie Joël in Waterloo and Kitchen Joël Antunes in the Mayfair area of the city. Earlier in his career, Antunes led the Ritz Carlton, Buckhead restaurant to a Mobil Five-Star rating. Before that, he earned his first Michelin star at Les Saveurs in London, and his formative experience ranges from the Le Normandie restaurant in Bangkok’s Mandarin Oriental hotel to early tutelage under such heady French chefs as Paul Bocuse. Chef Antunes (a Basque surname, pronounced an-tu-NESS) hails from France but spent much of his youth in sub-Saharan Africa, where his father worked for Michelin — the tire folks, not the restaurant reviewers, although their provenance is the same. He is known for a gilded French style, rich in flavor and often achingly heavy with artistic adornment, but also often showing influences of Asia and Italy. While in Atlanta, Antunes won the James Beard Foundation award for Best Chef in the Southeast region in 2005. He seems to be widely regarded as an excellent chef and visionary restaurateur. How his ornate French style will fit into his predecessor Lee Richardson’s legacy of Arkansas-rooted Southern elegance is yet to be determined. Here’s hoping that Little Rock and the Capital Hotel are indeed a good match for Chef Antunes. We look forward to trying his wares soon.